As part of a current commitment to support and promote digital innovation and local businesses, Public Reputation is now a proud provider for Lynn University’s Internship Program. As part of a current commitment to support and promote digital innovation and local businesses, Public Reputation is now a proud provider for Lynn University’s Internship Program. 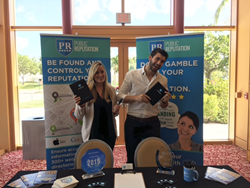 On Oct. 11, 2017, Public Reputation’s Alvaro Nunez and Maeve Greenaway attended Lynn University’s Internship Fair in pursuit of motivated marketing interns to join their growing digital marketing team. “We are happy to have new businesses attend our annual internship fair and are grateful for the opportunities they present to our students and alumni,” said Barbara Cambia, Executive Director of Lynn's Center for Career Connections. The Internship Fair is designed to help students identify full- and part-time internship opportunities. It is open to students of all majors and degree levels within the university community, as well as alumni. The event is coordinated by the Center for Career Connections, which also provides workshops, career counseling, resume coaching, employment research, skill assessments and more. “The students came dressed to impress, willing to do on-site interviews and brought well-prepared resumes,” said Greenaway, Director of Marketing for Public Reputation. Public Reputation is working on building a strong relationship with the university's students and employees for future opportunities. Currently, Public Reputation has been growing at a fast pace and it was a perfect time to start the company’s internship program. “We want to give potential students the opportunity to join our team and learn everything related to digital marketing while enrolled in school,” said Nunez, from Public Reputation. Public Reputation was able to form this evolving business relationship thanks to Nunez, a Lynn University alumnus. Nunez moved from Madrid, Spain, to the U.S. on a tennis scholarship, where he completed his bachelor’s degree before moving to Florida to complete his MBA at Lynn. While attending Lynn, Nunez remained very active while working with their marketing and athletic departments. Since his graduation from Lynn, Alvaro has worked his way up the corporate ladder at Public Reputation. With the help of Nunez and Greenaway, Public Reputation has hired three part-time digital marketing interns and was able to hire a full-time digital marketing manager. “We are excited for our growth and future involvement with Lynn University,” said Benzion Aboud, CEO of Public Reputation.